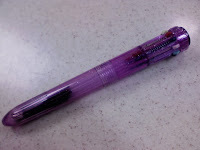 This is a picture of a pen one of my co-workers was using yesterday. Until she puts in the batteries. Are you trying to incinuate something here? Haha!! At least it's not my pen. I was wondering when you were going to post that picture. Ah...fun times. well does it move or gyrate, any humming noises? well has anyone used it lately??? It doesn't have to make noise, move or gyrate. I actually stopped using it when one of our doctors asked what it was. Hee! Hee! Hee! Made me blush.